Nitratifractor salsuginis Nakagawa et al. 2005 is the type species of the genus Nitratifractor, a member of the family Nautiliaceae. The species is of interest because of its high capacity for nitrate reduction via conversion to N2 through respiration, which is a key compound in plant nutrition. The strain is also of interest because it represents the first mesophilic and facultatively anaerobic member of the Epsilonproteobacteria reported to grow on molecular hydrogen. This is the first completed genome sequence of a member of the genus Nitratifractor and the second sequence from the family Nautiliaceae. The 2,101,285 bp long genome with its 2,121 protein-coding and 54 RNA genes is a part of the Genomic Encyclopedia of Bacteria and Archaea project. Strain E9I37-1T (= DSM 16511 = JCM 12458) is the type strain of Nitratifractor salsuginis, which in turn is the type and currently only species of the genus Nitratifractor . The genus name is derived from the Neo-Latin word nitras meaning nitrate and the Latin word fractor meaning breaker, yielding the Neo-Latin word Nitratifractor meaning nitrate-breaker . N. salsuginis strain E9I37-1T was isolated from a deep-sea hydrothermal vent chimney at the Iheya North hydrothermal field in the Mid-Okinawa Trough in Japan [1,2]. No further isolates of N. salsuginis have been obtained so far. Here we present a summary classification and a set of features for N. salsuginis E9I37-1T, together with the description of the complete genomic sequencing and annotation. A representative genomic 16S rRNA sequence of strain E9I37-1T was compared using NCBI BLAST under default settings (e.g., considering only the high-scoring segment pairs (HSPs) from the best 250 hits) with the most recent release of the Greengenes database  and the relative frequencies, weighted by BLAST scores, of taxa and keywords (reduced to their stem ) were determined. The four most frequent genera were Nitratiruptor (48.5%), Nitratifractor (20.7%), Hydrogenimonas (15.7%) and Alvinella (15.1%) (eleven hits in total). Regarding the single hit to sequences from members of the species, the average identity within HSPs was 100.0%, whereas the average coverage by HSPs was 95.6%. Among all other species, the one yielding the highest score was Hydrogenimonas thermophila, which corresponded to an identity of 88.5% and an HSP coverage of 67.2%. (Note that the Greengenes database uses the INSDC (= EMBL/NCBI/DDBJ) annotation, which is not an authoritative source for nomenclature or classification.) The highest-scoring environmental sequence was AF420348 (‘hydrothermal sediment clone AF420348’) , which showed an identity of 96.7% and an HSP coverage of 97.8%. The five most frequent keywords within the labels of environmental samples which yielded hits were ‘cave’ (7.2%), ‘biofilm’ (5.7%), ‘sulfid’ (5.3%), ‘spring’ (4.8%) and ‘structur’ (3.1%) (239 hits in total). The five most frequent keywords within the labels of environmental samples which yielded hits of a higher score than the highest scoring species were ‘hydrotherm’ (8.6%), ‘vent’ (7.5%), ‘pacif’ (4.0%), ‘microbi’ (3.7%) and ‘mat’ (3.0%) (37 hits in total). These keywords are in accordance with the origin of the strain N. salsuginis E9I37-1T from a deep-sea hydrothermal vent chimney at the summits of the sulfide mounds in the sediment-hosted back-arc hydrothermal system Iheya North [1,2]. The 16S rRNA based tree in Figure 1 shows the phylogenetic neighborhood of N. salsuginis E9I37-1T. The sequences of the two identical 16S rRNA gene copies in the genome do not differ from the previously published 16S rRNA sequence (AB175500). 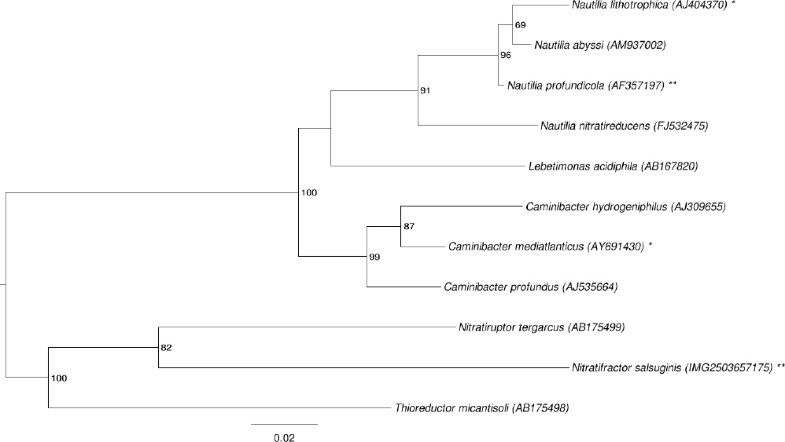 Phylogenetic tree highlighting the position of N. salsuginis strain E9I37-1T relative to the other type strains within the family Nautiliaceae. The tree was inferred from 1,356 aligned characters [6,7] of the 16S rRNA gene sequence under the maximum likelihood criterion  and rooted in accordance with the current taxonomy. The branches are scaled in terms of the expected number of substitutions per site. Numbers to the right of bifurcations are support values from 200 bootstrap replicates  if larger than 60%. Lineages with type strain genome sequencing projects registered in GOLD  are labeled with an asterisk when unpublished, and with two asterisks when published . The closest BLAST hit to N. salsuginis (see above) does not belong to Nautiliaceae, and this family does not appear as monophyletic in the last version of the 16S rRNA phylogeny from the All-Species-Living-Tree Project . The species selection for Figure 1 was based on the current taxonomic classification (Table 1). However, an analysis including the type strains of Nautiliaceae and its neighboring families Campylobacteraceae, Helicobacteraceae and Hydrogenimonaceae (data not shown) did not provide evidence for the non-monophyly for any of these families. The cells of strain E9I37-1T are generally rod-shaped of 2.5 µm in length and 0.6 µm in width (Figure 2) and usually occur singly or in pairs (Figure 2) . Strain E9I37-1T is a Gram-negative, non-motile and non spore-forming bacterium (Table 1). The organism is anaerobic to microaerophilic (0.09-0.55% O2 (v/v)) and chemolithoautotrophic, growing by respiratory nitrate reduction with H2 as the electron donor, forming N2 as a metabolic end product . The main electron acceptors are NO3- or O2 . Strain E9I37-1T uses S0 as a source of sulfur . The doubling time of strain E9I37-1T was about 2.5 h . The NaCl range for growth is between 1.5% and 3.5%, with an optimum at 3%; no growth was observed below 1.0% NaCl or above 4.0% NaCl . The temperature range for growth is between 28ºC and 40ºC, with an optimum at 37ºC . The pH range for growth is between 5.6 and 7.6, with an optimum at pH 7; no growth could be detected below pH 5.2 or above pH 8.1 . Strain E9I37-1T was unable to use any organic compounds as energy or carbon sources . The organism was sensitive to ampicillin, rifampicin, streptomycin, chloramphenicol (each at 50 µg ml-l) and kanamycin (200 µg ml-1), and insensitive to approximately 150 µg ml-1 kanamycin . Enzymatic and genetic analyses demonstrated that strain E9I37-1T uses the reductive TCA (rTCA) cycle for carbon assimilation . This was confirmed by the presence of all genes encoding the three key rTCA cycle enzymatic activities, namely ATP-dependent citrate lyase, pyruvate:ferredoxin oxidoreductase, and 2-oxoglutarate:ferredoxin oxidoreductase , but it was found to lack the gene for ribulose 1,5-bisphosphate carboxylase (RubisCO) activity, the key enzyme in the Calvin-Benson cycle . Classification and general features of N. salsuginis E9I37-1T according to the MIGS recommendations . The major cellular fatty acids of strain E9I37-1Tare C18:1 (42.3% of the total fatty acid), C16:1 (30.7%) and C16:0 (24.3%), C14:0 3-OH (1.1%), C14:0 (0.9%) and C18:0 (0.7%) . It should be noted that no information is given on the position of double bonds in the unsaturated fatty acids. No attempt has been made to examine the type strain for the presence of respiratory lipoquinones or to determine the polar lipid composition. N. salsuginis E9I37-1T, DSM 16511, was grown anaerobically in DSMZ medium 1024 (Nitratiruptor and Nitratifractor medium)  at 37°C. DNA was isolated from 0.5–1 g of cell paste using Jetflex Genomic DNA Purification Kit (GENOMED 600100) following the standard protocol as recommended by the manufacturer. Cell lysis was enhanced by adding 20 µl proteinase K for two hours at 58°C. DNA is available through the DNA Bank Network . The genome was sequenced using a combination of Illumina and 454 sequencing platforms. All general aspects of library construction and sequencing can be found at the JGI website . Pyrosequencing reads were assembled using the Newbler assembler (Roche). The initial Newbler assembly consisting of 42 contigs in five scaffolds was converted into a phrap  assembly by making fake reads from the consensus, to collect the read pairs in the 454 paired end library. Illumina GAii sequencing data (158.03 Mb) was assembled with Velvet  and the consensus sequences were shredded into 1.5 kb overlapped fake reads and assembled together with the 454 data. The 454 draft assembly was based on 60.3 Mb 454 draft data and all of the 454 paired end data. Newbler parameters are -consed -a 50 -l 350 -g -m -ml 20. The Phred/Phrap/Consed software package  was used for sequence assembly and quality assessment in the subsequent finishing process. After the shotgun stage, reads were assembled with parallel phrap (High Performance Software, LLC). Possible mis-assemblies were corrected with gapResolution , Dupfinisher , or sequencing clones bridging PCR fragments with subcloning. Gaps between contigs were closed by editing in Consed, by PCR and by Bubble PCR primer walks (J.-F. Chang, unpublished). A total of 135 additional reactions were necessary to close gaps and to raise the quality of the finished sequence. Illumina reads were also used to correct potential base errors and increase consensus quality using a software Polisher developed at JGI . The error rate of the completed genome sequence is less than 1 in 100,000. Together, the combination of the Illumina and 454 sequencing platforms provided 106.7 × coverage of the genome. The final assembly contained 274,574 pyrosequence and 2,079,398 Illumina reads. The genome consists of a 2,101,285 bp long chromosome with a G+C content of 53.9% (Table 3 and Figure 3). Of the 2,175 genes predicted, 2,121 were protein-coding genes, and 54 RNAs; 33 pseudogenes were also identified. The majority of the protein-coding genes (66.9%) were assigned with a putative function while the remaining ones were annotated as hypothetical proteins. The distribution of genes into COGs functional categories is presented in Table 4. 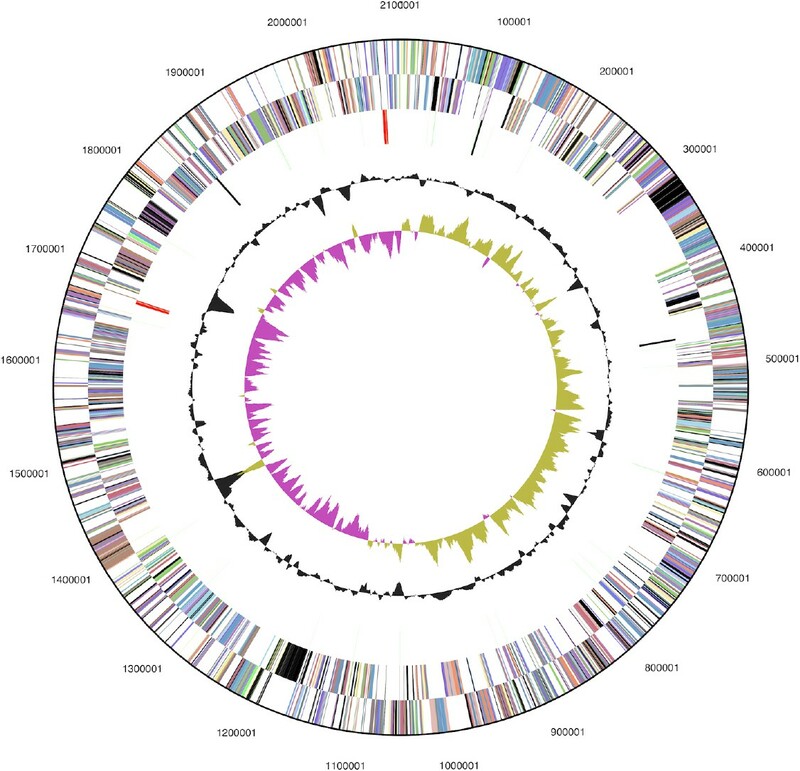 Graphical circular map of the chromosome; From outside to the center: Genes on forward strand (color by COG categories), Genes on reverse strand (color by COG categories), RNA genes (tRNAs green, rRNAs red, other RNAs black), GC content, GC skew. We would like to gratefully acknowledge the help of Andrea Schütze (DSMZ) for growing N. salsuginis cultures. This work was performed under the auspices of the US Department of Energy Office of Science, Biological and Environmental Research Program, and by the University of California, Lawrence Berkeley National Laboratory under contract No. DE-AC02-05CH11231, Lawrence Livermore National Laboratory under Contract No. DE-AC52-07NA27344, and Los Alamos National Laboratory under contract No. DE-AC02-06NA25396, UT-Battelle and Oak Ridge National Laboratory under contract DE-AC05-00OR22725, as well as German Research Foundation (DFG) INST 599/1-2.